The University of Education, Winneba (UEW) has lived by its promise of promoting local content and businesses within the Effutu municipality. The University has ensured that about 80% of its supplies come from indigenous businesses in the community. This was disclosed by the Vice-Chancellor of the University, Prof Anthony Afful-Broni, at a short donation ceremony at the forecourt of the main administrative block, North campus, Winneba, to present items to three institutions. 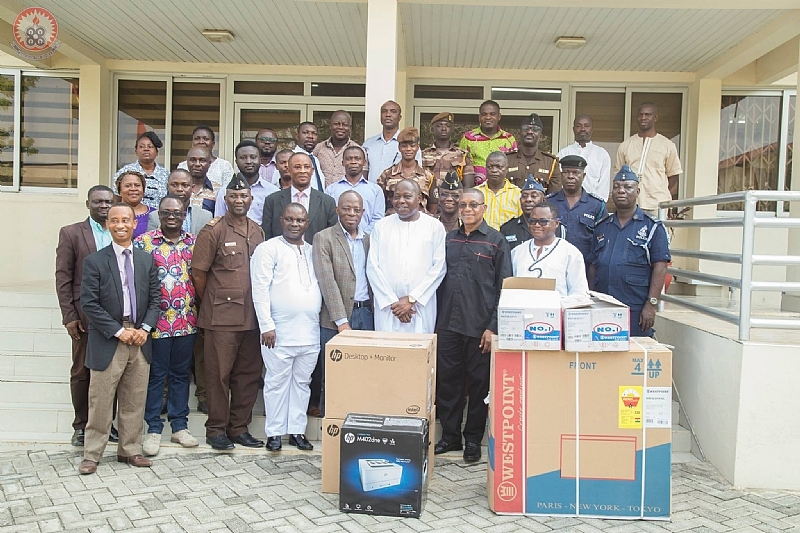 The ceremony saw Ghana Police Service receive two desktop computers with a printer to facilitate administrative work. The Ghana Prison Service also received a chest freezer and five ceiling fans while the University Practice Primary and Kindergarten "C" received two packets of roofing sheets and ten bags of cement. Speaking at the ceremony, the Vice-Chancellor, Prof Anthony Afful-Broni stressed the need for a strong relationship with the community and affirmed the commitment of the University to continue to support agencies in the community in order to improve the quality of life in the municipality. He added that he had long been an advocate of a strong school-community relationship and had demonstrated that in some of his research publications. In recent times, the University has taken steps to give meaning to its Corporate Social Responsibility to the community by ensuring that 30 of the 121 financial clearance slot received from Government went to indigenes. The University recently donated fifty thousand cedis (GHC50,000.00) to the Effutu Municipal Assembly to procure street lights for improved visibility and security at night in the municipality. Chief Superintendent Godfred Adjirakor, Winneba District Police Commmander, thanked the University, the Vice-Chancellor and his Management Staff for the donation. He state that the items had come at the right time and promised to ensure the proper utilization of same.